1. Preheat the oven to 120˚C, gas mark ½. Line 2 large baking sheets with baking parchment. Using electric beaters and a clean mixing bowl, whisk the egg whites, a pinch of salt and 75g caster sugar until soft peaks form. Add the icing sugar and whisk at high speed for 3-4 minutes, until a very thick, glossy meringue forms. Add the cornflour, vinegar and vanilla seeds. Whisk briefly to combine evenly. 2. Spoon half the meringue into a piping bag fitted with a plain nozzle (alternatively, you can use 2 teaspoons). Pipe or spoon the equivalent of heaped teaspoonfuls onto the baking sheets, making about 60 mini meringues in total (30 per sheet). Scatter 30g desiccated coconut evenly over the tops of the meringues; it should stick. Bake for 50-60 minutes, swapping the trays halfway, until the meringues are just firm to the touch. 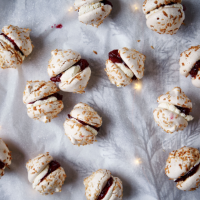 Turn the oven off, prop the door open and leave the meringues inside until cool. 3. Meanwhile, put the cranberries in a pan with the orange juice, vanilla pod and remaining 45g caster sugar. Bring to the boil, stirring often, and simmer for 15 minutes, until thick. Cool completely; remove the vanilla pod. Softly whip the cream; stir in the remaining 15g coconut. Sandwich the meringues together with the cream and cranberries. Serve soon, before they soften. The unfilled meringues will keep for 1 week in an airtight container.